The International League of Peoples’ Struggle (ILPS)-Korea supports and expresses solidarity with the Korean Confederation of Trade Unions (KCTU), South Korea in their general strike on April 24 and its Labor Day commemoration in May 1, 2015. We salute the KCTU in consolidating its leaders and members for its dauntless decision to stage a general strike. This will show forth your force to change the plight of workers and to pursue the demands for better working conditions, increase wages and basic benefits for all workers. 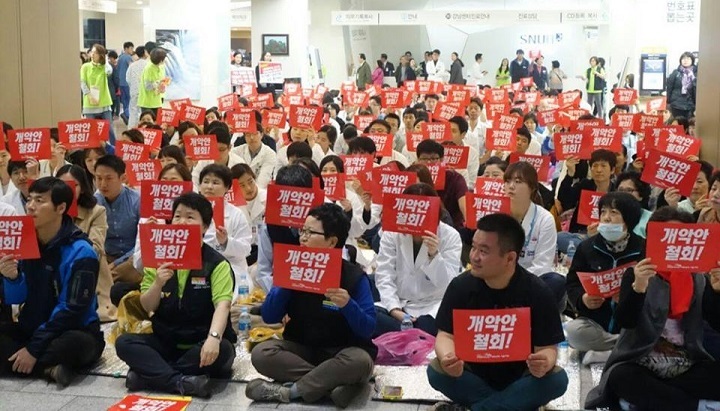 The strike demands to abolish the oppressive labour market reforms policy of the Park Geun-Hye government that has been deliberated in the National Assembly and are being pushed for acceptance by trade unions without resistance. We know that while the right to stage labor strikes is ensured in the Korean Constitution, this has been regulated and stifled to the point of total repression by past and present governments. Labor leaders can face criminal prosecution, or charge for compensation damages and disciplinary measures are meted out including dismissal from job. Expansion of the range of jobs where labour dispatch is permitted. We support your demand for raising minimum wage. The government’s ‘Labor Market Reform’ policies are geared in decreasing if not freezing the workers’ wages and allowing flexibility in labor contracting such as in hiring and firing of workers. The government has been the handmaiden of Korean conglomerates and foreign invested corporations that serves their profit oriented schemes instead of increasing workers’ economic power, securing job tenure and health and pension benefits. The present minimum wages of KRW 5,580 per hour or KRW 1,166,220 per month has been way below the basic subsistence living wages set since May 2014 of KRW 1,506,179. There is at least 22.6 percent gap between the standard subsistence wages and the actual wages received by workers. The demand to raise the minimum hourly wage at KRW 10,000, in reality, is merely an alleviation of the deteriorating purchasing power of the workers and serves to augment the living wages of those classified as low income wage earners. We assent your demand to stop the public pension cuts and improve the National Pension System. The attempts of government through the National Pension System (NPS) in pushing ahead with the Equity of Differences in Pension Systems, will further deprive retired pensioners of adequate pension support. This scheme aims to equalize all types of pensions such as civil service, military, private company and other types of pensions with varying amounts of pension will eventually reduce the amount and quality of social services that can be accessed by pensioners. This will exacerbate the poverty situation and income inequality among senior citizens. What government should do is an upward equalization of pension systems by increasing the benefits level of the National Pension System and Basic Old-age Pension. It should be accountable as well for stable funding of the pension benefits as employer of the civil servants. We unite with you for asserting fundamental labor rights for all! Just application of Labour Standards Act for all! Revision of Article 2 of TULRAA! We support and unite with your demand to assert the fundamental rights of workers regardless of the size of industries especially in SMEs with workers less than five employees that accounts for 3,480,000 or 19.15 percent of the whole working population. The Labour Standards Act does not cover all of them. The government should enact laws that shall eliminate contractualization of labor especially the more than six million ‘temporary workers’. Also there are those who are categorized as ‘precarious workers’ including workers in the disguised employment relationship and indirect employment relationship and the foreign migrant workers numbering more than 500 thousand that are not able to exercise the right to organize and right to bargain collectively. The Migrants Trade Union must be duly accredited as legitimate labor union of foreign migrant workers. They too must have equal protection of the labor laws. Together let us expose the horrors of the neoliberal imperialist agenda and schemes! Workers in Korea, in Asia-Pacific and around the world should unite in exposing and resisting the manipulative and oppressive schemes within the framework of neoliberal imperialist economy headed by U.S. that calls nations to join the Trans-Pacific Partnership Agreement (TPPA), a deceptive scheme and cover-up for support to the US war economy and military industrial complex. The TPPA will only aggravate the economic recession in the Asia-Pacific region, where heavy burden are placed upon the working class, the poor and the 99% of the populations who have been considered as sources of profit and will not receive any benefit from this agreement. The strength of the workers and people’s movements against the growing oligarchy has been intensifying in response to the global economic crisis. ILPS Korea commends and joins all efforts to broaden the support and rally the people to expose and oppose the TPPA and all other US-led free trade agreements and schemes hell-bent on economically saving the global 1% at the expense of the struggling peoples of the world. We call on greater international solidarity between the Korean people and the peoples of the countries in Asia-Pacific region against the renewed US imperialist economic intervention epitomized by the TPPA, and for the unconditional respect for the sovereignty and right to self-determination of the countries of the Asia-Pacific region.